Welcome to the next installment of the Cali dress sewalong. Previously, we got started by choosing a size and cutting out our paper pieces. Now to snip into that fabric! Let's break it down. You'll notice that the pattern calls for you to match the selvedge edges of your fabric and fold in half, with the right sides facing in. The selvedge edges of your fabric look like tightly woven bands running down the sides – you'll spot them easily because they're finished and don't fray. 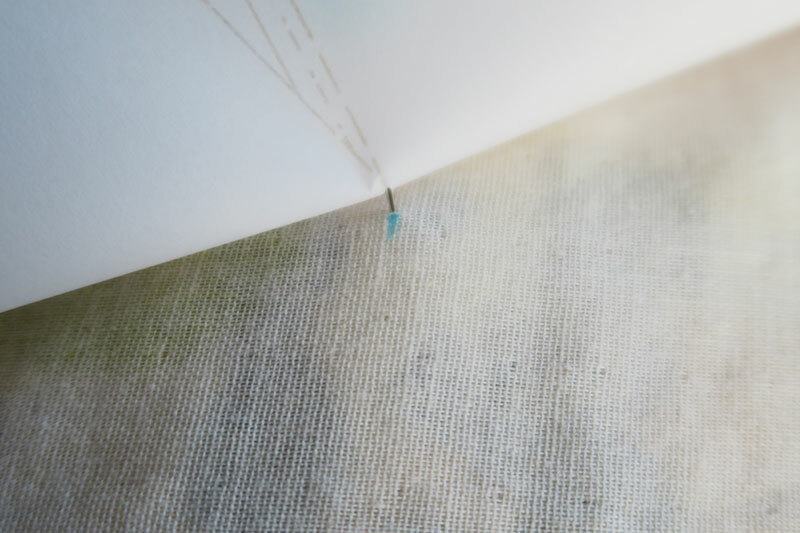 Often, the name of the fabric, design house or a colour bar is also printed in the selvedge. Match the selvedges and fold your piece of fabric in half. The right side (printed side or "correct" side) of the fabric should face inwards. This is because we are going to place markings on the surface of the fabric, so we'd rather they remained on what is to be the inside of the garment later. Place your paper pattern pieces onto your fabric, following the diagram in your booklet. That said, feel free to break the recommended layout here. For example, if your fabric has a stand-out motif that you want on the front of the dress, place your front bodice piece first and shuffle the other pieces to fit. Just make sure you get all your pieces in! It is also important to note that the front bodice piece and front skirt piece are both cut on the fold. These pieces must be lined up with the folded edge so that you avoid a big seam running down the front of your dress. As you place and pin your pieces, pay attention to the grainline marking on each piece. On woven fabrics, the grainline is the thread that runs parallel to the selvedge edge. The fabric is the strongest along this line and offers the least amount of stretch. It is important to line your pieces up with the grainline to make fitting and sewing easier. Remember, your seam allowance is accounted for on the pattern piece, so you can cut out directly along the edge of the paper piece. Now you should have all your pieces cut. But don't be too quick to take those pins out! Now to transfer the pattern markings to your fabric. Take note of the darts – we are going to mark these on our fabric. First, mark the bottom two lines at the edge of the fabric. Next, place a pin through the paper and into the fabric, marking the peak of the dart. Lift the paper and mark where the pin enters the fabric. And there you have it, dart markings transferred! I like to keep my paper piece attached to my fabric one until I come to sew it. That way, you know exactly what piece of the garment you're looking at. While there aren't that many pattern pieces in the Cali dress, it's a good habit for when you're working with more complex patterns. The admin work is all done, promise. Next time, we will do a bit of real sewing when we put together the bodice!